Big Brother fans will be able to “shop the Big Brother house” through a new partnership with Shop Direct Group’s Very.co.uk. The Liverpool-based company has set up a microsite to promote its partnership with the Channel 5 series. 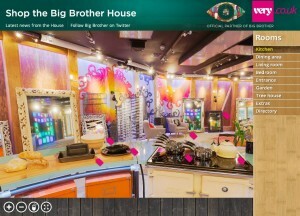 This includes an interactive Big Brother house, where users can click on items and buy them online. The deal, which was brokered by Carat in January this year, sees Very supply home and electrical goods, branded dressing gowns and suitcases for the participants. The click-to-buy page, which features on Very.co.uk as well as Channel5.com was a key part of the deal. “The partnership has been designed to deliver maximum impact for Very.co.uk through product placement, click-to-buy technology on channel5.com and the incorporation of Very.co.uk into Big Brother’s infamous tasks,” added Rachel Gibbs-McNeil, Carat sponsorship associate director.